A journalist looks at the new series Barbie "Inspiring Women", featuring (L-R) Amelia Earhart, Frida Kahlo and Katherine Johnson that honors three historic figures who each made a major mark on the world on March 7, 2018 in New York. Mexican artist Frida Kahlo, French chef Hélène Darroze or snowboarder Chloe Kim now have their Barbie, as well as a series of other famous women, unveiled March 7, 2018 by Mattel, who is trying a new marketing move to address the slowdown in sales. 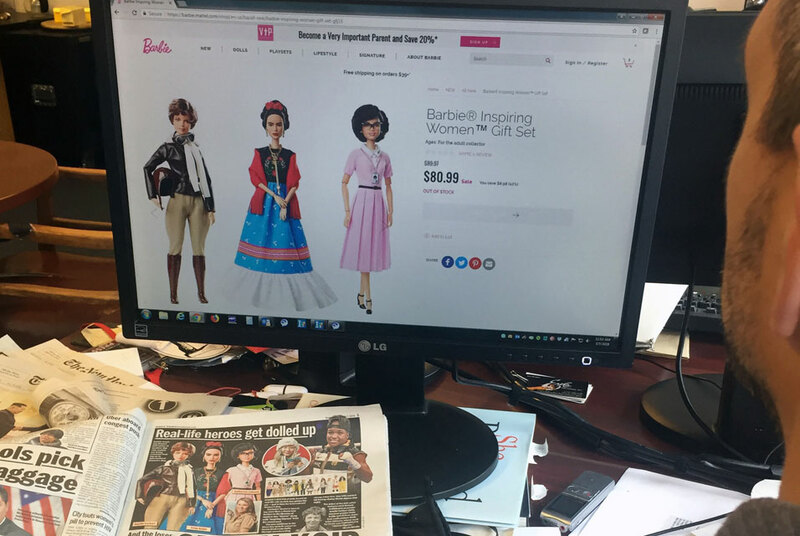 This week Mattel introduced dolls in two separate series of Barbies: "Inspiring Women," based on historical figures, and new additions to its "Shero" line of dolls named for inspirational contemporary women. Laura BONILLA CAL / AFP. MEXICO CITY (AFP).- A dispute has erupted over toy company Mattel's new Frida Kahlo Barbie doll, with the late Mexican artist's family and a Miami-based corporation arguing over who holds the rights to her image. Released just ahead of International Women's Day, the "Inspiring Women" collection includes dolls based on Kahlo, pioneer aviatrix Amelia Earhart and other historic figures. But Kahlo's family soon issued a statement objecting to the doll. "I would have liked the doll to have traits more like Frida's, not this doll with light-colored eyes... It should be a doll that represents everything my aunt represented, her strength," she told AFP. Romeo's lawyer Pablo Sangri said the family established the Frida Kahlo Corporation in partnership with another company called Casablanca Distributors in 2005. But the latter has violated their contract by failing to inform Kahlo's relatives about the uses of her image, he told AFP.